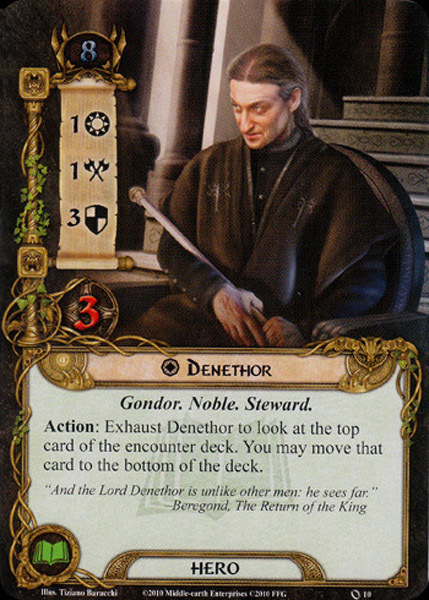 Denethor II (Third Age 2930 – 3019, aged 89 years) was the twenty-sixth and penultimate Ruling Steward of Gondor. He succeeded his father Ecthelion II at his death in T.A. 2984. 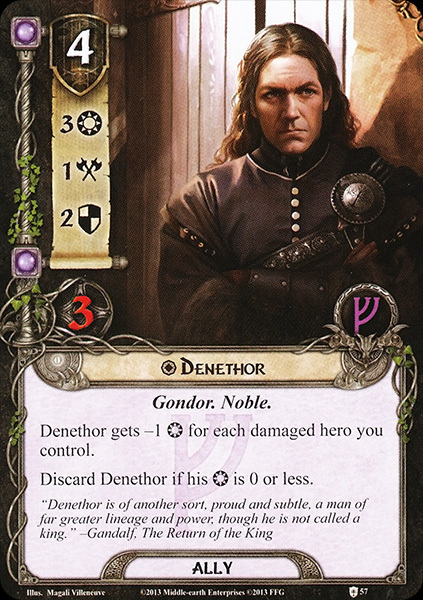 Denethor was described as appearing noble and powerful, even to rival the lordliness of Gandalf. He was proud, tall, wise, far-sighted, and valiant; 'more kingly' than any of his predecessors for a long time. He proved a masterful lord and a great ruler, seeing to all things large and small under his command. 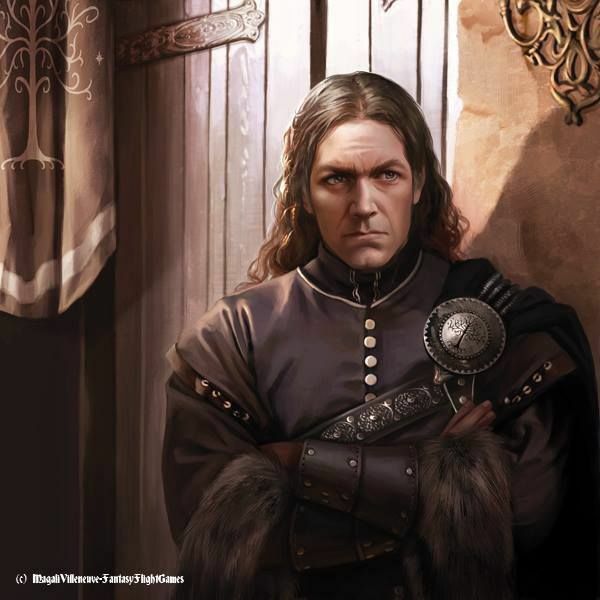 Eight years after his marriage, Ecthelion died and Denethor became Ruling Steward. Denethor was not viewed very highly in the eyes of his people in comparison to Thorongil, and moreover there were already dark rumors of power rising in the east. For these reasons, Denethor looked into the long-forbidden Anor-stone, seeking to surpass Thorongil and Gandalf in wisdom, and to keep an eye on them. Because of the manner of his viewing, he was greatly strained and aged prematurely. He prepared a pyre for him and Faramir in Rath Dínen. He was hampered in his aim by Beregond, one of his own Guards of the Citadel, and Gandalf, who removed Faramir from the pyre. When Faramir called his name, Denethor seemed willing to abandon his suicidal designs, but suddenly he raised up the palantír and prophesied the doom of Gondor, acknowledging that a new enemy was about to arrive: the pirates from Umbar. In a final speech to Gandalf, he said that he would have liked for things to be as they had always been in his life: to be a ruling Steward of a free city, ruling in peace and with his sons masters of their own will. But if he had to see his city in the hand of an illegitimate King, and his son turned into the pupil of a wizard, than he preferred to have nothing and to decide how to end his own life. He took the white rod of his office and broke it on his knee, casting it into the flames, symbolizing the end of his stewardship and the end of the rule of the Stewards. He then laid himself down on the table with the palantír on his breast and so perished. Faramir did survive, and the city did not fall due to the timely appearance of the Rohirrim and the Dúnedain with Aragorn II. Faramir kept the title of Steward, but not of Ruling Steward, for he recognized Aragorn II right to take the throne. Saving Faramir, Eowyn and Merry's life using Athelas, Aragorn II was first acknowledge as the 'King' by the people of Minas Tirith, before he could actually claim the title. Faramir's reaction to his father's death is not recorded, but it is said that the news of his death wasn't given to him, during the first days of his recovery, in order not to grief him. 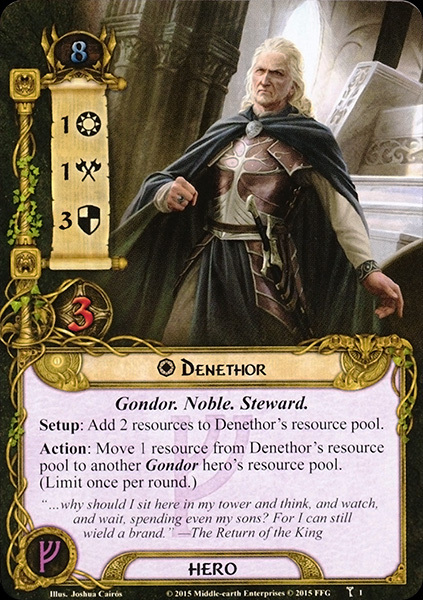 Denethor was named after the Nandorin chieftain of the First Age. The name is Nandorin fit into the Sindarin sound range, and is said to mean 'Lithe and lank'.